In any activity an organisation undertakes, whether strategic, operational or tactical, the activity can only be successful with the input, commitment and support of its people - stakeholders. Gaining and maintaining the support and commitment of stakeholders requires a continuous process of engaging the right stakeholders at the right time and understanding and managing their expectations. Unfortunately, most organisations have difficulty implementing such culture change, and need assistance and guidance to implement a consistent process for identification and management of stakeholders and their changing expectations. As a continuous improvement process, stakeholder management requires understanding and support from everyone in the organisation from the CEO to the short-term contractor. This requires the concepts and practices of effective stakeholder management to become embedded in the culture of the organisation: 'how we do things around here', this book provides the 'road map' to help organisations achieve these objectives. The text has two specific purposes. Firstly, it is an 'how-to' book providing the fundamental processes and practices for improving stakeholder management in endeavours such as projects, and program management offices (PMO), it also gives guidance on organisational survival during mergers and acquisitions, preparing for the tender bidding, and marketing campaigns. 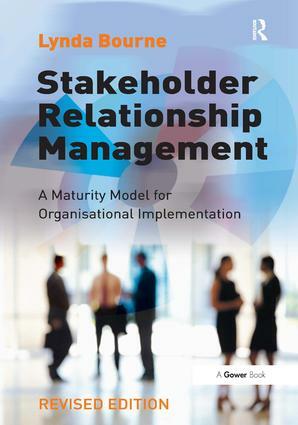 Secondly, Lynda Bourne's book is for organisations that have recognised the importance of stakeholder engagement to their success, it is a guidebook for assessing their current maturity regarding implementation of stakeholder relationship management with a series of guidelines and milestones for achieving the preferred level of maturity. Dr Lynda Bourne is an award winning project manager, consultant and trainer with 25 years professional industry experience. She was the 2003 winner of PMI Australia's 'Project Manager of the Year' award and was granted PMI's Robert J. Yoursak tuition scholarship for the 2004/2005 academic year, for completion of her doctoral dissertation for the award of Doctor of Project Management. She is a recognised international authority and author on stakeholder management. She has presented at conferences and seminars in Europe, Russia, Asia, USA, New Zealand and Australia to audiences of project managers in the IT, construction, defence and mining industries, and has published papers in many academic and professional journals.